Description: the T-Rex stands in an aggressive posture, its head curved to the left and its arms outstretched as if attacking something. The tip of the tail is bent pointing upwards and to the left. The majority of this Tyrannosaurus figure is painted basic brown, while the belly, throat and base of the tail are coloured almost a yellow type of brown. A series of thick black stripes runs from the neck over the back and the first half of the tail, with additional black highlights on the head, also around the eyes and on the lower jaw, as well as near its knees and the back of the lower legs. On either side of the figure, a pair of long red stripes runs from the base of the neck almost to the end of the tail, while seven smaller red stripes are located on the upper legs. The facial area around its small yellow eyes is also painted red. The inside of the mouth is not painted, but the figure has white teeth, as well as black claws on both arms and feet and a white JP III logo on its left upper leg. Its feet are supported by extra small plastic bases in the same dominant brown colour, so it can stand on its legs more easily. The Velociraptor stands in a stalking pose, its right arm and leg stretched outward and its head raised upwards with its mouth open, as if it means to jump onto something. The tail is raised upwards and bent leftwards at the tip. Most of this figure is coloured black, except for its throat and belly, which are painted reddish brown, and the very top part of the neck, back and base of the tail which is bright red and ends in a fork motif right above the cat like yellow eyes. The Raptor is equipped with a series of grey stripes, spots and dots of various sizes all over the black parts of its body. Both the claws and inside of the mouth are unpainted. The creature has white teeth and a white JP III logo on its left upper leg. Analysis: this Lava 2-pack is one of the less successful entries in the otherwise fairly impressive CamoXtreme repaint line, both in regard to the paint jobs of the figures as in the overall idea. 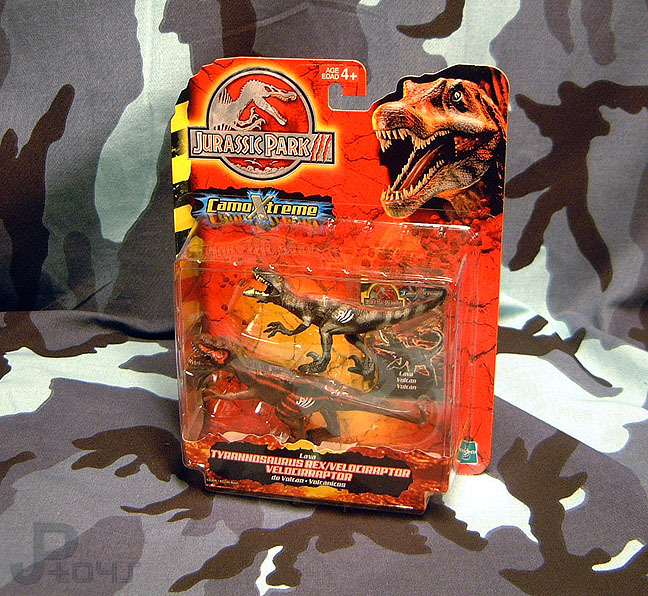 The original JP III T-Rex mini figure sported a paint job not all that dissimilar from this Rex, also with black stripes and a lot of brown (though of a more passive hue). The red stripes add a little bit, but are distributed in a rather dull fashion. Sadly, the Rex remains equipped with feet supports, which still quite often don't keep it from falling over. The Velociraptor also isn't blessed on the front of originality with its new paint job. In fact, the red stripe on its back is virtually identical to the stripe on its predecessor. The black and grey motive adds more diversity though, but it's a real shame details like the claws and inside of the mouth were wholesomely neglected. The whole idea of dinosaurs living in a 'lava' environment is generally both cliché ridden and ridiculous. Apart from the silly backward notion that the Mesozoic age was filled to the brim with active volcanoes on every corner, as often seen in comic strips and old Saturday morning cartoons, the thought of dinosaurs (or any animals for that matter) residing in a hot spot of fiery chasms and lava flows, as pictured on this set's collector's card, is stupendously idiotic. Tough and nasty as Rexes and Raptors were, lava would just kill them anyway, nor would many potential prey venture in such territories. And evolving alongside dormant volcanoes would not yield such fiery paint jobs. Hasbro undoubtedly intended the idea of a 'Lava' environment to spawn awesome paint jobs, but unfortunately the result certainly failed in that regard. Repaint: yes. Both figures were originally featured in the JP III toy line. The Tyrannosaurus came with the Military General figure in Wave I of that line, while the Velociraptor teamed up with Alan Grant, also for Wave I. Both dinosaur figures would be repainted over and over again for JP Dinosaurs 2/3 and JP 2009, up to the point we couldn't care less about either sculpt. Overall rating: 5/10. If you don't own the original JP III sculpts yet, this set might be interesting for you: if not, it is a rather bland addition to your collection. It's just not nearly as good as some of the other CamoXtreme paint schemes and has little to offer beyond that, except for the nice new collector's card completing this set. The CamoXtreme 2-packs are a bit harder to find than most other Hasbro JP dinosaur 2-packs, but not (yet) excessively so. You can still find them irregularly on eBay for a fair price. These 2-packs were imported in the Benelux in decent quantities, making them also fairly easy to find there.